National Velvet tells how a twelve-year-old butcher’s daughter, Velvet Brown (Elizabeth Taylor), helped by a vagabond ex-jockey (Mickey Rooney) wins the Grand National steeplechase. It is the best thing to see at the moment, next to another very happy MGM technicolor film, Meet Me in St. Louis, The subject is likable and unworn (at least when it is dealing with the horse, the girl and her jockey friend and not with the girl’s family, which it gets at in the usual movie way), and seems unusually well suited to the screen, since it moves around a good deal in fine, breezy country and has a simple story structure built around one thrilling event, which usually makes for a stronger job than the more snarled plots do. Pandro Berman, the producer, and Clarence Brown, the director, have made it into a conservatively exciting and engaging film whose chief virtue is its acting, especially a letter-perfect, beautifully felt performance by Mickey Rooney as the jockey. Miss Taylor seemed to me vaporous, though beautiful, either because she is actually a negative screen personality or is made to seem so alongside a particularly virile, smart group of actors, which includes Rooney, Anne Revere and Donald Crisp (who are her parents), a thin-skinned red horse, which appears to be running faster than any horse I’ve ever seen in the movies, and the child, Jackie Jenkins, who still seems cut off from this civilization and has been wisely left (as Margaret O’Brien and Skippy Homeier have not been) more child than actor. 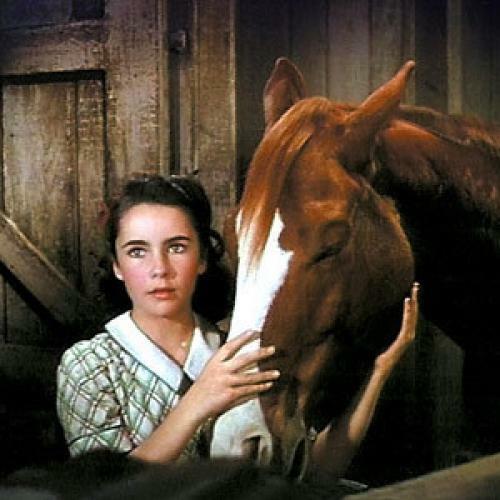 In die traditional MGM manner, the writing and directing of National Velvet seldom tighten onto any of its events objectively or analytically, but stay at a safe level of making everybody and everything indefinitely pleasant, comic or happy. It is typical of MGM’s lack of daring that the relationship between Velvet and her jockey friend, which is one of the more interesting in current movies, is left untouched while the film spends endless time building up your knowledge of what funny, corny things happen in the Brown family. The thing I miss most in the picture is a loving, interested appraisal of the year’s training of the race horse; but that is probably the kind of information MGM would feel was too specialized for mass appeal. This generalized treatment can be especially provoking when it shifts your eye from the center of an event to the edge, where you either can’t see it (for instance, a lot of Velvet’s rides over the countryside and Rooney’s doctoring of the horse), or it is too poor a view to matter, as at the steeplechase, where the film hardly gets in sight of Velvet and herhorse. At rare moments the movie turns objectively on a fact and usually comes up with something extraordinary. There is a drunk scene played by Rooney that is actually bewitching (and one of the best scenes I ever saw) because of its marvelous timing and use of hands, voice and eyes. The credits are also recorded against a poetic scene of Rooney walking along an English road that seemed to me, for the realism of Rooney’s walking and the good setting and music, more bona-fide than almost anything that followed it. Then there is a breathtaking moment during a raffle when Crisp manhandles a heckler and is given a chance to be hard and grim, which he can be as effectively as anybody I know of in films.